In the decade that followed, the Board of Public Works has issued State Tidal Wetlands licenses for numerous Living Shoreline projects in Maryland’s tidal waters5. Based on this body of experience of BPW-licensed Living Shoreline projects, now is an appropriate time to evaluate the success of the Living Shoreline approach. Evaluate success for these 16 living shoreline projects. Inform the Board of Public Works about whether the intent of the 2008 amendment has been fulfilled. Encourage the creation of a Living Shoreline database in Maryland usable by living shoreline designers, property owners with living shorelines, and property owners considering this approach. Of 16 Living Shoreline projects evaluated, 15 are successful. This study focused on three specific criteria assessed based on site visits to each site without detailed scientific study. The three criteria include the project’s ability to: stem erosion, establish native vegetative cover of 85%, and have low incidence of invasive plants6. Stemming erosion: Fifteen of 16 sites eliminated or substantially stemmed erosion through the installation of stone sills or breakwaters7. Vegetative cover: Fifteen of 16 sites had at least 85% vegetative cover, meaning that a viable native plant community is established. This threshold is a marker for success8 in wetland mitigation projects. Invasive plants incidence: While thirteen of 16 sites had the invasive Phragmites species present, it was present in low levels. These projects will require monitoring and annual herbicide application to eradicate Phragmites. Success of these three baseline criteria can be used to infer that overall living shoreline projects are providing additional ecosystem services as well9. The Wetlands Administrator and the Wetlands Associate visited 16 Living Shoreline projects in the summer and fall of 2017 and 2018. Though State tidal wetland licenses authorize the State to access project sites, for the purposes of this study each licensee was contacted to obtain permission for the Wetlands Administration’s site visit. As a result, most site visits included a project designer or the licensees themselves who were enthusiastic about discussing their project. Has the project halted erosion? Has living shoreline design remained intact, been undermined by erosion, or been destroyed? Does the project have 85% vegetative cover? Living shoreline projects with 85% or greater cover with native plants are considered successful. What is the incidence of invasive plant cover? Little or no invasive plant cover is required by Maryland Department of the Environment (MDE) licenses and U.S. Army Corps of Engineers (USACE) permits for newly-established living shoreline projects. If invasive plants are present, a plan to remedy the problem is required. Wetlands Administration created a form to record project information at each site. Findings concerning the three criteria, project size, current condition, and other additional benefits were tabulated10. Specifically, field observations were recorded for the presence of invasive plant species, sill height11, degree of erosion, and additional observable benefits. Photos were also taken at each site12. Fourteen projects had no erosion; one had some erosion; the one unsuccessful project had severe erosion. Fifteen projects had 85% or greater vegetative cover with native plants. Only one project – the project showing severe erosion – had less than 85% vegetative cover. Six projects had no invasive plants; eight projects had up to 5% Phragmites; two projects had up to 15% Phragmites. Three of the ten projects with Phragmites have plans for herbicide treatment to eradicate it. NOTE: Phragmites australis was the only invasive plant noted during this study. The 14 projects with no erosion are, according to the above criteria, successful. The one project with some erosion is also a success as it is characterized by more than 85% native-plant cover and contains no Phragmites. Although ten projects had some Phragmites, the small concentration of invasive plants does not offset those projects’ success in stemming erosion and providing abundant native plants. The Wetlands Administration concludes that the results of Living Shoreline projects affirm Maryland’s decision a decade ago to adopt a preference for the Living Shoreline method of shore erosion control in response to climate change and sea level rise. The following table and photo log provide field data collected for these projects. 1 Chapter 304, 2008 MD Laws​. 2 A Living Shoreline is a “nonstructural stabilization method” that uses plants, sand, rock, or other natural materials to protect against erosion and to create, maintain, or enhance wildlife habitat. 3 § 16-201(c), ENVIRONMENT Article, Annotated Code of MD. Examples of structural measures include riprap, retaining walls, and bulkheads. Living Shorelines are the preferred method of shore protection. 5 The BPW issues all State tidal wetlands licenses pursuant to § 16-202, ENVIRONMENT Article. 6 MDE permit and license requirement and USACE permit requirement. 7 Stone sills and breakwaters are stone barriers located along the shoreline that absorb wave energy and dissipate erosion. 9 Additional ecosystem services can include wildlife habitat, aesthetics/cultural heritage values, recreation, aquifer recharge, flood storage, carbon storage, water quality improvement, and education. 11 Sill height is a measurement of interest to designers and was not a criterion for success. 12 See Photo Logs 1-3. Some Chesapeake Bay Natural History, featuring the Bay Oyster! 2016 -- 400,000 oyster bushels/year harvested. One constant in the Chesapeake Bay over the last 100+ years – oysters are important. While in the past they were loved both by watermen harvesting them and consumers relishing their salty taste, today we have an additional reason to love them. They help us clean the Bay! In 2016, the Bay watershed was home to 18.1 million people – 6.08 million in Maryland. Development pressure on the Bay watershed is enormous -- we love living, fishing, recreating, and farming near the Bay and we consequently compromise its water quality. The three major contributors to the poor water quality of our streams, rivers, and the Bay – nitrogen, phosphorus, and sediment are a tough pollution mix to combat. The 83,000 farms located in the Bay watershed (8/9/18 Bay Journal) contribute nitrogen pollution to the Bay (45% according to the CBF website), yet air pollution, stormwater runoff, and wastewater treatment are also major contributors. Since most of us are part of creating the waste stream for the latter three items – our daily habits can help curb pollution from these three! Oysters help clean up Bay waters since they are filter feeders. They pump water through their gills, trapping particles of food as well as nutrients, suspended sediments and chemical contaminants (Chesapeake Bay Program). Whether you personally like eating oysters or not, they filter more than 50 gallons of water in a single day! Next time you enjoy an oyster with a dash of horseradish, appreciate the job they are doing to help clean up the Bay! Doesn’t the marsh above located in North Beach, Calvert County look like a scene from a pretty picture book? 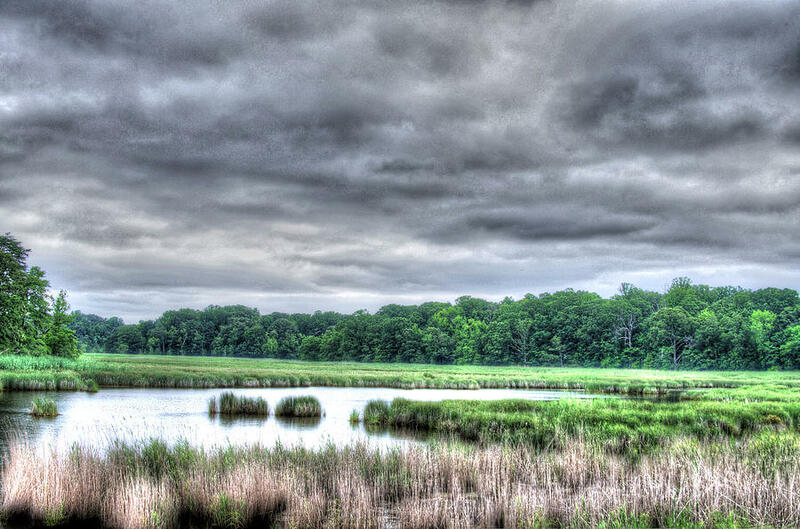 This marsh is only one of many wetland types in Maryland. Marsh is considered an estuarine type of wetland, while other Maryland wetland types include palustrine, riverine and lacustrine. The other, the Cowardin System, is a taxonomical approach that inventories Maryland wetlands into estuarine, palustrine, riverine, and lacustrine categories.2, 3 I’ll use the latter approach to reference wetland types in Maryland. In an earlier blog post, “Maryland Salt Marshes: Workhorse Ecosystems Worthy of Respect” the most familiar type of estuarine wetland in Maryland – the tidal salt marsh was discussed. In estuarine wetlands, where salt content is greater than 18 parts per thousand, expect to smell sulfur gas released by wetland soils. In Maryland, estuarine wetlands are found along the Atlantic and Bay coastlines, and in the higher salinity portions of Bay rivers. Palustrine wetlands are considered freshwater wetlands though some are subject to tidal fluctuation and their salt content is less than 5 parts per thousand. Salt from the ocean is filtered out of the water through a combination of plants and soils, creating a completely different ecosystem from the tidal salt marshes. Soil gases contain methane, resembling the smell of a cow field. Plant species diversity increases dramatically in palustrine wetlands since the stressor of high salinity is removed. In Maryland, palustrine wetlands include both swamps and tidal freshwater marshes. An earlier blog post mentioned Battle Creek Cypress Swamp (below), a beautiful local example of a palustrine wetland. Riverine wetlands can be found along freshwater rivers and streams with green blankets of aquatic vegetation, emergent (herbaceous) wetlands, scrub-shrub wetlands or forested wetlands. The Patuxent River trail (below) is an example of this type of ecosystem. 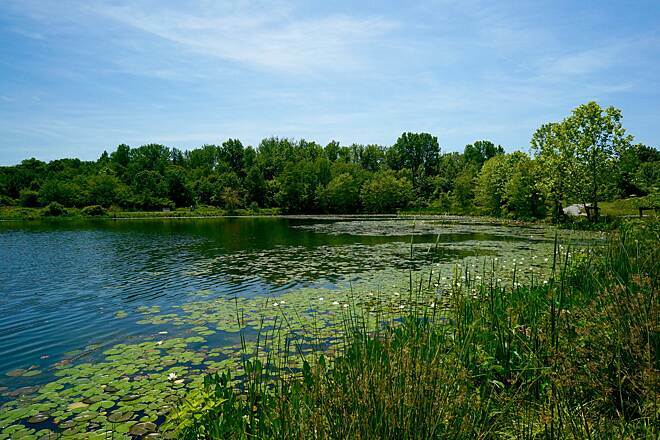 Lake Artemesia in College Park (below) with its abundant lily pads and cattails is a freshwater lacustrine wetland ecosystem, consisting primarily of non-tidal marshes. Lily pads and cattail mark the boundaries of these lacustrine marshes and make up the common vegetation type for many lakes and ponds in Maryland. 1 Brooks, R. P., Brinson, M. M., Havens, K. J., Hershner, C. S., Rheinhardt, R. D., Wardrop, D. H., & Rubbo, J. M. (2011). Proposed hydrogeomorphic classification for wetlands of the Mid-Atlantic region, USA. Wetlands, 31(2), 207-219. 2 Cowardin, L. M. (1979). Classification of wetlands & deepwater habitats of the US. Diane Publishing. 3 Tiner, R. W. (2016). Wetland Indicators: A Guide to Wetland Formation, Identification, Delineation, Classification, and Mapping. Crc Press. Tell Me About Wetland Ecosystem Services! Historically “swamps” were synonymous with dark, murky forests, lurking crocodiles in algae-filled water, and maybe even a lonely ogre. While the layperson’s appreciation today for wetlands has increased, it is still the case that the breadth of services that swamps and other wetlands provide is greatly underestimated. Collectively the many valuable services that wetlands provide are termed “wetland ecosystem services.” Let’s examine these services. Biological diversity: wetlands provide habitat for many trees, plants, birds, fish, amphibians, crustaceans, and insects – more than a third of U. S. threatened and endangered species live in wetlands! Aquifer recharge: wetlands hold large amounts of standing water that slowly leaches into the ground. This recharges aquifers – large areas of saturated soil that provide drinking water for over 115 million Americans. Water quality improvement: when waters flow through wetlands, a wetland’s plants and soils together with wetland chemical processes filter pollutants thereby enhancing water quality. Storm abatement, flood storage, and flood mitigation: wetlands are exceptionally useful at slowing and absorbing water, serving as an important component in flood protection. In many cases, when it comes to flood protection, wetlands can be more economical and stronger than floodwalls and levies. Carbon sequestration: all types of wetlands are carbon sequestering systems (aka “carbon sinks”). That means wetlands have the ability to store excess carbon (via photosynthesis) from the atmosphere – one of the primary components of greenhouse gases and a driver of climate change. Drainage and degradation of wetlands can release significant amounts of this stored carbon back into the atmosphere in the form of methane and reduce the ability of wetlands to sequester additional carbon. Better management practices can help protect these stores of carbon and the ability of wetlands to sequester it. (ASWM, 2018) See 6/15/15 blog on Blue carbon, the type of carbon stored by coastal wetland vegetation. Nitrogen cycling: chemical processes in wetlands soils allow N2 gas to be returned to our atmosphere (made up of 78% N2) whereas most upland soils pull nitrogen from the atmosphere but cannot return it. Aesthetic, cultural, and provisioning: the beauty of many wetlands inspires art, wetlands provide a home and livelihood for many cultures, and when wisely managed can provide us with plentiful and varied seafood options. As mentioned in the previous Migration blog, most avian migration flyways use wetlands for feeding or as a final destination. Recreation: many tourists enjoy recreating in wetlands to fish, swim, bird-watch, kayak, and canoe. During 2016, there were 35.8 million total anglers in the United States, accounting for a total fishing expenditure of $46.1 billion (USFWS, 2016). Many sport and commercial fish species depend on wetlands for all or part of their life cycles. Birding is currently enjoyed by more than 45 million Americans (USFWS, 2016). Wetlands are also a prime destination for all types of recreational boaters. Ecotourism has recently gained world-wide popularity. Education: wetlands are complex habitats that give people the opportunity to ask questions about their formation, services they provide, and organisms they house. Healthy wetlands are a self-sustaining ecosystem providing a wealth of wetland ecosystem services for animals and humans alike. These habitats serve as a bridge between terrestrial and aquatic environments and help maintain processes in each, creating a net benefit that should not be underestimated. Maryland winters with their chilling temperatures, snowy and icy grounds, and barren landscapes are the catalyst for many local birds and more than 350 species throughout North America to migrate to the warmer, more bountiful equator. As winter days grow shorter and colder the “bird brain” changes causing avian restlessness and increased appetites in preparation for migration. Some birds actually double their body weight during this period! Next, birds form flocks and migrate to winter destinations using the sun and stars, natural landmarks, and the earth’s magnetic field. Many of Maryland’s locals take south for the winter, with species like the osprey, Baltimore oriole, and great blue heron vacating the state in exchange for warmer climates. For some northern birds, Maryland is their southern migration destination, with species like tundra swans, Canada geese, and dabbling ducks making Maryland their winter home. This past December I enjoyed the unique sounds of tundra swans (click here!​) at my favorite local park on the Magothy River. The Chesapeake Bay serves on the wing as an active migration flyway and on the ground as a food source with abundant wetlands serving as a rest stop for migrating birds. Since wetlands are important bird habitat for food, shelter, water, and nesting, it’s no surprise that the Chesapeake Bay is a hot travel destination during migration as an avian “rest stop” or to hunker down until spring. The Bay is migratory home to roughly 1,000,000 waterfowl during winter, roughly one third of all waterfowl wintering along the Atlantic. The tundra swans I spotted on the Magothy River, feed on Bay submerged aquatic vegetation such as redhead grass, widgeon grass, and sago pondweed. Most admire the wonder of this annual bird migration, yet it’s worth mentioning that humans have caused some migration impediments. Birds sometimes collide with urban skyscrapers, particularly those with reflective windows, and anthropogenic magnetic fields and light pollution at night beckon birds to stray from their usual paths. The warmth of cities entice species like the Canada goose to become permanent residents, causing disruption to urban ecology with large goose populations polluting waters with goose poop ...and causing a mess! While it’s important to protect and restore Maryland’s wetlands for the many services they provide (more about this in next month’s blog), these wetlands also serve an important role in bird migration. Many Americans enjoy watching birds during migration… and throughout the year. The 45 million American bird watchers contribute over $75 billion a year to the U.S. economy. So by investing time and money towards wetland protection and restoration, we are protecting wetlands’ avian inhabitants… and investing in a stronger economy. Note: February 2nd is World Wetlands Day! Check here for February 2, 2015 post on the significance of World Wetlands Day. An important chapter of Maryland history with relevance today is the Oyster Wars saga beginning around 1830 and featuring oyster pirates, boat chases, gun fights, and cannons. Through the nineteenth century, skirmishes pitting pirates against enforcement officers, and tongers against dredgers occurred fairly often and even resulted in fatalities. Today, having moved beyond the fierce Oyster Wars, watermen, environmental scientists, elected representatives, and Marylanders, still retain their deeply-held, and often conflicting, opinions about harvesting and restoring Bay oysters. Current trends are hopeful for the future of Maryland oysters. The 1865 Maryland General Assembly, hoping to protect Maryland watermen against oyster seekers arriving from Virginia and New England, restricted oyster catches in State waters and required anyone harvesting or selling oysters to obtain a license from the Comptroller – but only Maryland residents could be licensed. By 1874 the Maryland Oyster Navy operated nine vessels outfitted with cannons that cruised State waters, verifying that those catching, buying, or selling oysters be licensed, and violators would be arrested. Today oysters are still in great demand – highly valued for both their environmental contributions (cleaning the Bay water they inhabit and producing live bottom) and for harvesting (from the Bay to your dinner plate). These facts will provide context for analyzing oyster harvest and restoration issues. 1. Maryland’s current oyster population is at record low levels compared to historic levels. Based on harvest records oysters have declined to less than 2% of historical harvest levels. 3. Oysters clean the Bay and its tributaries - an average oyster is able to filter up to 30 gallons of water a day. 4. An oyster bar has firm shell bottom built up over centuries from generations of oysters inhabiting an area. A bar is a two-dimensional structure with a typically low oyster population and varying numbers of oysters depending on spat setting rates. 4. An oyster reef is a dense population of oysters that creates a three-dimensional structure on the Bay bottom. Because a reef contains many oysters, they attract many other organisms and create a diverse ecosystem. A reef can develop in as few as 3 to 5 years as a result of a strong natural spat set or a dense planting of hatchery seed. Reefs and well-populated bars provide habitat for crabs, clams and finfish, as well as promoting oxygen mixing to offset dead zones. 1. DNR is responsible for conservation management of fisheries, fish resources, and aquatic life in Maryland 6 , including oyster harvesting and restoration. 2. DNR’s Oyster Advisory Commission, established in 2007 and restructured in 2016, is charged with advising DNR on Bay oyster issues – specifically, strategies for “rebuilding and managing the oyster population.” 7 Currently, the Commission is a 23-member group composed of watermen, scientists, lawmakers, and environmentalists. 3. DNR manages oyster harvesting and the oyster population through two management types: Harvest Areas and Sanctuaries Areas. • Harvest Areas are those areas where oyster harvesting is legal. They are managed by season, daily limits, a size limit on oysters to conserve oyster broodstock, and other laws. Some harvest areas are planted with hatchery produced seed oysters to boost harvest levels. • Sanctuary Areas are State-designated and marked areas that prohibit the harvest of oysters. Of 51 sanctuaries in Maryland, three have large scale oyster restoration projects underway, with two more in the selection phase. Most sanctuaries have only limited amounts of restoration efforts underway due to lack of funding. • Maryland established the first oyster sanctuaries in the 1960s and expanded them in the 1990s, with a more recent and significant expansion occurring in 2010. 4. In 2010, DNR designated the sanctuary areas that exist today. 8 The 51 sanctuaries cover approximately 9,000 acres or about 24% of the Bay’s estimated remaining oyster bar habitat. 2. Lack of hard Bay bottom and oyster shell. • Young oysters grow by attaching themselves to older oysters or to other hard surfaces. • Siltation and historical harvesting have buried or stripped away older oyster shell and other hard surfaces. Nearly 70% of oyster reef habitat along the Bay bottom and its tributaries has been lost to siltation. • Successful demonstration projects have shown how to successfully build oyster reefs with old shell, concrete, and construction rubble, and then plant these structures with oyster spat. 1. The Oyster Advisory Commission is currently evaluating potential changes to the sanctuary program. These changes include plantings for sanctuaries, modifying boundaries (reducing some/expanding some), creating rotational harvest zones that will limit and rotate harvest to provide for harvest and ecological value, and selecting two additional tributaries for large scale restoration that will bring Maryland’s commitment up to five restoration tributaries. 2. Legislation from the 2017 General Assembly 11 prevents DNR from reducing or altering the current oyster sanctuaries boundaries until a management plan is developed following completion of DNR’s final report to the Governor and Oyster Advisory Commission on its stock assessment study in December 2018. 3. An increasing number of watermen are obtaining leases and adding oyster farming as an additional income source while continuing their work in public fishing grounds. Alan Wilner, at 66-68 (1984). 6 Section 4-202, Natural Resources Article, Annotated Code of Maryland. 7 Section 4-204, Natural Resources Article, Annotated Code of Maryland. 9 U.S. Army Corp of Engineers Environmental Assessment (2009). On December 28th, two STEM students from South River High school, Natalie Moning and Joshua Baker, came to BPW to ask questions about wetlands for a radio broadcast. Below are excerpts from our discussion to be featured on CRAB radio this coming spring. Do you have any personal stories with wetlands to share? Growing up in suburban Massachusetts, I explored streams and wetlands with friends near my house when we were in elementary school. We used to frequent one extensive wetlands system bursting with acres of tall reeds; constructing huts out of those reeds was very cool! As a teenager I loved discovering the varied marshes and beaches of Cape Cod. Relocating to Maryland as an adult, I’ve enjoyed exploring streams and wetlands with my family by kayak. My favorite Maryland wetland kayaking experiences include paddling the cypress swamps of the Pocomoke River and the tidal guts of Smith Island​. Describe your experiences with wetlands and their destruction. There is one that stands out. In my native Massachusetts, one of my tasks as a young wetland scientist included delineating wetlands. This involves work in the field setting the boundaries or edges of wetlands. I was delineating a property where the owner had established an extensive exotic animal zoo complete with ostrich, peacocks, and miniature deer. The problem was that the owner had filled in acres of wetlands to establish his awesome zoo! He told me he was not aware that laws prohibit the filling of wetlands; as we talked, it became clear to me that he did not understand the value of wetlands. This experience taught me the importance of educating the public concerning wetlands. It’s best if we can start teaching youth in elementary school to understanding the important functions and values provided by wetlands so this understanding is part of our culture. Why is this topic important for the public to understand? • Wetlands protect and improve water quality, provide fish and wildlife habitats, and store floodwaters. • Wetlands are among the most productive ecosystems in the world, comparable to rain forests or coral reefs. An immense variety of microbes, plants, insects, amphibians, reptiles, birds, fish and mammals can be part of a wetland ecosystem. - Wetlands are "biological supermarkets." They provide great volumes of food and attract many animals. These animals use wetlands for part of or all of their life-cycle. - Wetlands produce an invaluable material called detritus – dead plant leaves and stems that break down in the water to form small particles of organic material. This enriched material feeds many small aquatic insects, shellfish and small fish that are food for larger predatory fish, reptiles, amphibians, birds and mammals. • Wetlands store carbon within their plant communities and soil instead of releasing it to the atmosphere as carbon dioxide. In the Chesapeake Bay, salt marshes and seagrass beds absorb large quantities of CO2 from the atmosphere and store it, thus offsetting some climate change effects. The Bay’s coastal habitats – referred to as carbon sinks – store carbon accumulated over hundreds to thousands of years, a process known as carbon sequestration. • If we want to “Save the Chesapeake Bay,” we must protect and enhance Bay wetlands, a critical key to saving the Bay. What is being done to protect our wetlands? We are fortunate in Maryland because we have state wetland protection laws firmly in place that complement federal wetland protection laws. - The Clean Water Act was revised in 1972 and regulates pollutant discharge into rivers, lakes, and wetlands and has created water quality standards. Section 404 of the Clean Water Act regulates the discharge of dredge or fill materials into rivers and wetlands. - The Clean Water Rule was established in 2015 to clarify what is protected by The Clean Water Act. - The Tidal Wetlands Protection Act requires permits or license for filling or dredging in tidal wetlands. Licenses for these activities must be approved by the Board of Public Works (Maryland’s highest administrative body composed of the Governor, Treasurer, and Comptroller) in its role to oversee state assets because the State owns most tidal wetlands, (wetland areas influenced by the tides and connected to the Bay and the ocean). What type of wetland is most at risk today? Coastal wetlands are most at risk from development pressure and sea level rise. Surface temperatures on earth are rising causing glaciers to melt and seas to rise. We see evidence of sea level rise right here in Annapolis where City Dock and the Naval Academy flood far more frequently than they used to. These areas and other low lying areas, including many wetlands, are threatened by sea level rise. Maryland salt marshes are at risk due to sea level rise and some marshes are dying out because water elevations are too high and increasingly severe storms cause marsh grass mortality. New techniques are being used to combat salt marsh decline. For example, at the Blackwater Wildlife Refuge in Dorchester County sediment from nearby rivers is added to the marsh; dredged soil is deposited across the marsh to maintain marsh elevations so marsh grasses can thrive. Our region’s location provides a further quirky challenge as global climate impacts lead to sea level rise. During the last glaciation, glaciers extended down through northeastern and northwestern Pennsylvania. Around the boundary of where glaciers were located, the downward pressure and weight of the glaciers squeezed the land upward. Part of the area that was squeezed upward is the Chesapeake Bay. The resulting “glacial forebulge” has been sinking back ever since, at an average rate of a few millimeters a year. So sea level rise is greater than average in the Chesapeake Bay because we are also sinking as the oceans rise. What can the community do to further protect wetlands? • Learn more about wetlands by visiting a local nature centers. In Anne Arundel County you can visit Jug Bay Wetlands Center in Lothian and the Chesapeake Bay Foundation in Annapolis. In Queen Anne County you can visit the Chesapeake Bay Environmental Center in Graysonville. • Get out and explore wetlands: kayak, canoe, or paddleboard some of Maryland’s beautiful rivers like the Nanticoke; explore Janes Island State Park in Crisfield; the beaches and salt marshes of Calvert County or check out the Blackwater National Wildlife Refuge in Dorchester County. • Participate in public education events about wetlands. • World Wetlands Day is February 2nd. The Society of Wetland Scientists is holding a drawing and photo contest to honor WWD. • May is Wetlands month! See activities on the Environmental Protection Agency website. If you could tell the community one thing about wetlands and their impact, what would you say and why? We need to be vigilant about protecting and enhancing our wetlands everywhere. The Chesapeake Bay is unique in that we must balance many factors: we want to enjoy abundant crab and oysters harvests, clean drinking water, and beautiful places to recreate; yet we also want to build homes near the Bay and continue to support the agriculture and chicken industries. Protecting our wetlands can help improve Bay ecology. Protecting wetlands is key to Saving the Bay. SAV- short for Submerged Aquatic Vegetation, a name for underwater grasses – is an essential biological community in the Chesapeake Bay estuary. SAV abundance is an indicator of the Bay’s water quality and as we continue to clean up the Bay, underwater grasses should expand. • Providing habitat for our prized blue crab as well as for striped bass and other aquatic species. How much SAV lived in the Bay historically? Aerial photos from the early to mid-1900s suggest that SAV could be found covering 200,000 acres. Recreational crabbers would wade through SAV beds with long-handled nets and bushel baskets placed in inner tubes. The water was clear enough for the crabbers to see crabs lurking in the SAV beds, catch them in the net, and drop them into the basket. By the 1950s and 1960s Bay grasses declined significantly largely due to degraded water quality. Then 1972 brought Tropical Storm Agnes with significant rainfall and runoff, severely damaging Bay SAV. Apparently, tropical storms and hot temperatures are a bad combination for SAV. By 1984 Bay grasses covered only 38,958 acres. Promising results have now emerged from recent Bay cleanup efforts, however. By 2014 SAV rebounded to approximately 75,438 acres and in 2015 surveys recorded 91,621 acres. The 2015 SAV survey results indicate that the Bay is about halfway to meeting the goal of 185,000 acres of SAV set by the Chesapeake Bay Total Maximum Daily Load (TMDL). (Surveys are conducted by the hardworking scientists at the Virginia Institute of Marine Science [VIMS]). The recent rise in Bay underwater grass coverage may be attributed at least in part to the recovery of wild celery and other species in the fresher waters of the upper Bay; the continued expansion of widgeon grass in the moderately salty waters of the mid-Bay; and a modest recovery of eelgrass in the very salty waters of the lower Bay. Experts advise cautious optimism: widgeon grass is a “boom and bust” species whose abundance can rise and fall from year to year; a spike in the presence of widgeon grass does not guarantee that it will persist in future seasons.